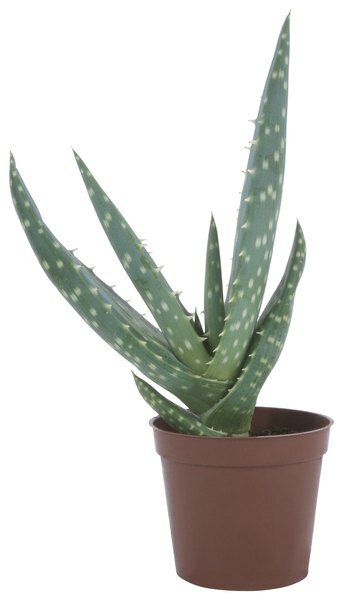 Aloe vera is medicinal for humans, but not for dogs. Hundreds of species of flora are potentially dangerous for dogs, many of them exotic or uncommon. Some of the more common plants harmful to dogs are plants you would never think a dog would look at as an epicurean delight. But of course, dogs eat everything. Some of the more common household plants are ones you would swear your dog wouldn't eat, but don't leave anything to chance. You may have an aloe vera plant in your kitchen, as so many households do, to help with minor kitchen burns; if ingested, it can make your dog very sick. And if you are growing an avocado pit on your counter, don't let your dog get too close. Other common plants that can harm your dog include corn plants, philodendron, satin pothos, jade plants, dieffenbachia and several species of daisy. Some of the more common plants to be found in gardens are great for one species but not for others. For example, the milkweed is attractive to colorful butterflies, and who doesn't want butterflies in the garden? But, sadly, milkweed is toxic to dogs. And if you're growing your own tomatoes for that healthy new diet you're so committed to, keep your dog away from them. They can cause severe health problems. Other garden variety plants are the morning glory, sago palm, cyclamen, elephant ear, begonia and asparagus fern. While out strolling with your dog, it's OK to stop to admire the neighbor's landscaping, just don't let your dog eat it. Plants and flowers that are popular with landscapers but toxic to dogs include, azaleas, hibiscus, amaryllis, rhodedendron, begonia, oleander, boxwood, gardenia, caladium, coleus, yew, hydrangea and many kinds of nightshade, ferns and ivy. Some trees are also toxic to dogs and that list includes the apple, wild black cherry, manchineel tree, oak, macadamia nut and elderberry. Holidays bring exotic plants and flowers into your home. Always check to see if these festive decorations are toxic to your dog. Shamrocks on St. Patty's day are divine, but if your dog sees them as a salad, you'll be singing "Molly McGee" on the way to the vet's office. Christmas plants include the poinsettia, holly, mistletoe and the Christmas tree itself. Easter means daffodils, tulips and several other plants grown from bulbs as well as lilies. Many flower arrangements are filled with baby's breath; pretty to look at but toxic to your pooch. This list is not inclusive and is meant to give you an idea of the over 700 species of plants that can harm your dog. Always know what you are bringing into your house and check to be sure it's safe. Are Evergreens Poisonous to Cats? Are Bonsai Plants Harmful to Cats? Do Aquarium Plants Absorb Ammonia? Are Rhododendrons Poisonous to Dogs? Are Bleeding Heart Plants Poisonous to Dogs? Are Tomato Leaves Dangerous for Cats & Dogs? Is Yucca Cane Dangerous for Cats? Are Cherry Blossoms Poisonous to Cats?